This festival isn't about just dance. ​It's about cultures, tradition, education for all ages, staying connected to our community and to our roots and breaking down barriers so there is equal accessibility to all. Our aim is to leave no one out due to ethnicity, background, disability, Ability, gender and GLBTQIA. This is important and keeps our country thriving enabling people to have creativity and freedom. This festival partnered with two beautiful Bay Area Museums. The Asian Arts Museum and Contemporary Jewish museum is excited to share their museum of beautiful culture, arts, tradition and history. Come visit the beautiful museum and learn about other culture. They will have ASL interpreter there, Wheel accessible. Please Call to request... For more information please CAREFULLY read below. 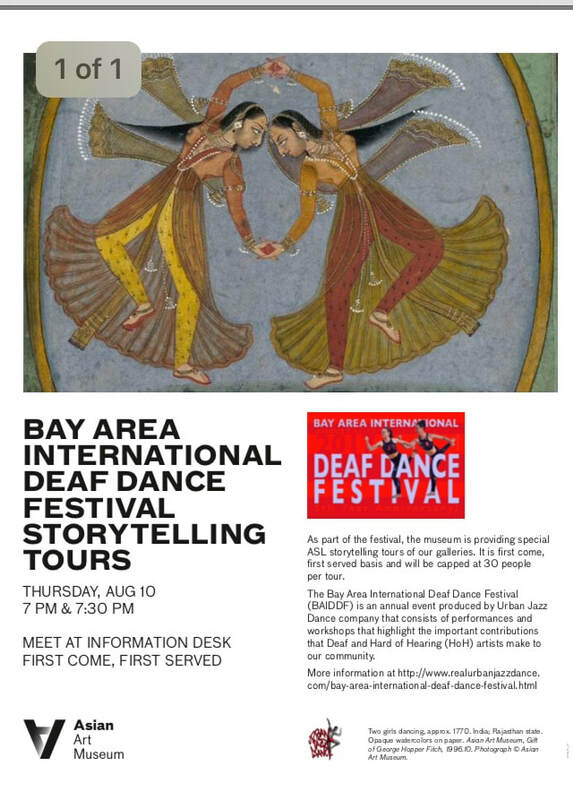 To celebrate the Bay Area International Deaf Dance Festival, the Asia Arts museum is offering two special storytelling tours with ASL interpretation in the evening. There is a 30 person limit to each tour, and on a first come, first served basis. RECEIVE FREE ADMISSION TO THE CJM!